Or are about to get denied. You see, I was there at one point. Actually I had a credit score below 600 FICO so I know how hard it can be. Credit scores mean very little to most of us. How is it that your score can be ‘bad’ or ‘good’? Understanding how a credit score is used and how it affects your life will convince you of the importance of your FICO. I’m also going to reveal how to increase your credit score and how I clawed my way back from financial ruin. Is a 600 Credit Score Bad Credit? So I hate the labels we put on everything and bad credit is one of the worst. OK, your 600 credit score isn’t good credit and it’s going to affect your life in more ways than you know. We’ll get to that in a bit but it doesn’t mean you’re locked out of the financial system. The FICO credit score ranges from 300 to 850 with the higher the better. Banks use this number along with your credit report to approve loan applications. Since your credit score is determined by what’s on your report, a lot of banks will simply look at your score for their decision. There’s no official cutoff for what’s good credit or bad. Most people say good credit is around 680 FICO or higher because that’s the point where you’re deemed ‘prime’ credit. It’s that point that you qualify for government loan guarantees so banks get a lot easier at approving loans. 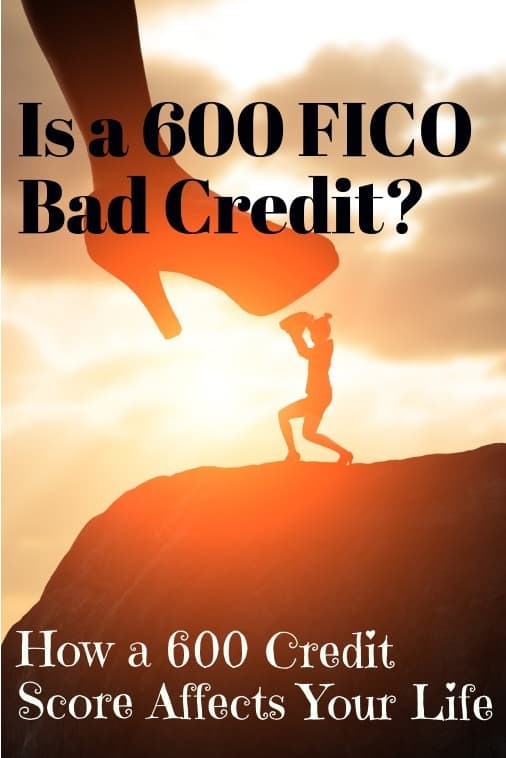 Is 600 FICO Bad Credit? Obviously, a 600 credit score is well below this point but it’s still not as low as I’ve seen. In fact, I had a score of just 560 FICO after destroying my credit in 2008 and have since built it back up to over 800 FICO. As with a lot of things in life, your credit score isn’t about where you are but where you’re going and how to get there. That’s what I want to help you with in this article, how to beat that ‘bad credit’ score. How Many People Have a 600 FICO? About one-in-ten Americans have a credit score between 600 to 649 FICO. About 20% of Americans have a credit score lower than this and 70% have a higher score. Don’t get discouraged by that, that still means over 100 million Americans have a credit score below that 670 cutoff for good credit. How Many People Have a 600 Credit Score? 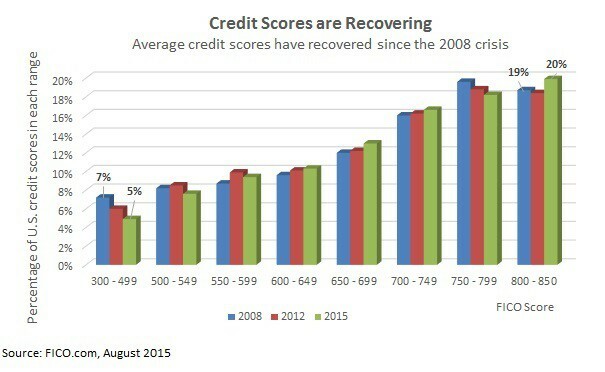 Credit scores have been increasing since the financial recession as some of those missed debts and defaults roll off your credit report. Even if you were one of the few to not see their score fall in the recession, a lot of banks just stopped lending. Now even for those with lower credit scores, banks are starting to lend again and the internet revolution has opened up many more opportunities. How Does a 600 Credit Score Affect Your Life? The biggest surprise people get when they look at their credit is how it affects their lives. Your credit score and what’s on your report is much more than just getting a loan. For example, did you know employers and landlords check your credit. A bad credit score may not only keep you from getting a mortgage but from getting a roof over your head period. It can also keep you from getting a job in banking or other financial careers. One of the most unfair ways your credit score is used against you is through what’s called credit-based insurance scoring. The National Conference of Insurance Legislators (NCOIL) Model Act of 2007 allows insurance companies to pull your credit report and use it as a factor in premiums. Drivers with bad credit pay, on average, 20% more for auto insurance than others. It’s the same in any kind of monthly contract service. People with bad credit pay more for cell phone plans and even cable TV. One of my favorite ways to increase a credit score, how I tacked on over 50 points to my credit score in 2009, is through a debt consolidation loan. In debt consolidation, you pay off your high-interest loans with a larger loan. This helps to save on interest and put you on fixed payments instead of the hamster wheel of credit cards. The problem is that a 600 credit score makes it very difficult to get a loan. Traditional banks and credit unions aren’t going to approve you because your score is too low for loan guarantees. The bank wouldn’t be able to sell your loan to investors. Not only does a 600 FICO make it hard to consolidate your debt, it also makes it impossible to get a loan for any other needs. If you run into an emergency expense, you could be stuck. That means you have to look to other alternatives to get the money you need. I used a personal loan to consolidate after destroying my credit in 2008. This is an online loan not secured by your home or car like with other loans. That personal loan helped me save thousands on credit card debt and consolidate other loans. I used PersonalLoans.com for my loan, a loan site specializing in bad credit loans, but have used and reviewed many others over the last several years. The table here shows the most often recommended personal loan sites by readers. Applying for a loan on any of these websites takes less than five minutes with some basic contact and employment information. Most loan sites require borrowers to have at least a part-time job making $2,000 a month. These personal loan sites are able to make loans to bad credit borrowers because investors directly fund the loans. Interest rates are higher than with traditional banks but are still well below the rates most people pay on credit cards. Consolidating your debt with a personal loan is a good way to get back on track and out from under the crushing burden of credit cards but there are a few other things you can do to improve your credit score. In fact, you might want to try some of these before applying for a consolidation loan. Raising your credit score just 20 or 30 points can lower your interest rates significantly and save thousands on any loan. Pay off as much of your credit card debt as possible. Credit debt or ‘revolving’ debt hurts your credit score more than other loans because there’s no fixed payment or payoff date. Check your credit report for errors, missed payments and loan defaults. You can get errors removed from your report by writing to the credit bureaus. Removing just one mistake can boost your credit score by double-digits. Work with any creditors or collections agencies to get bad marks removed from your report. Tell them you’ll pay in full if they promise to remove the mark. Applying for a personal loan results in a soft-pull of your credit report, the same thing that happens when you’re pre-approved for a credit card. This means the loan sites can approve your loan and estimate a rate without affecting your credit report. That’s why I recommend applying on at least two or three loan sites before accepting a loan to make sure you’re getting the lowest rate available. Having a 600 credit score doesn’t have to mean you’re locked out of the financial system, even if traditional banks won’t help you. Understand how credit score affects your life and what that means for your finances. The more you know about your credit, the less it will seem a mystery and the closer you’ll be to reaching your financial goals.